Google Chrome is the most widely used internet Browsing software today. This software developed by Google developers is the most used because it is easy to use and very fast in accessing the internet. Not only for internet users, but most webmasters also use Google Chrome to develop their website. Can add addon or third party extensions on chrome that help webmaster performance. Quickly accessible and support in almost all programming languages. Can audit the performance of a website. 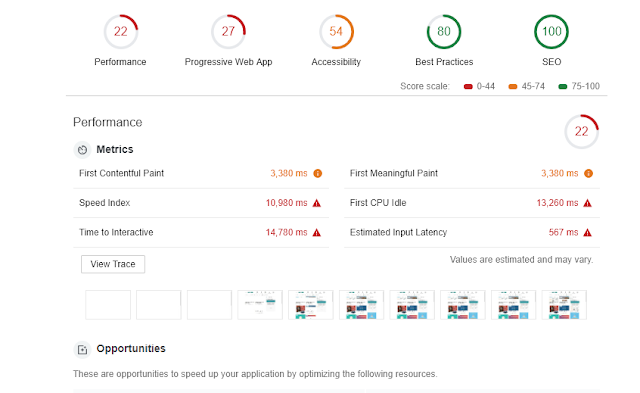 From some of the advantages above, other browsers that cannot be used are the performance audit of a website, which includes speed, accessibility, SEO and PWA. And now only Google Chrome can audit some of these things. In this section, I will explain How to Audit Blog Performance using Google Chrome step by step. To audit a Blog or Website, you must first access your website in Google Chrome, then press F12 or CTRL + Shift + I. The Inspect element tab will appear. Click Audit. If the audit tab does not appear, follow the instructions in the picture above. After you click Audit, the audit tab will appear, select desktop mode if you want to audit the website for Desktop display, or select Mobile for smartphone display. Click Run Audits, and wait a while until the rendering process is complete. This score will be your reference to improve the website. Besides using above method, Google has also updated Google PageSpeed Insight, which uses the same tools as those in Google Chrome. Read the following article for audit web performance using Google PSI.